The task: “Write a short story about what you see in the picture…” A standard process for 4th and 5th graders two centuries ago! So, in today’s world, how might we continue this relationship between images and words? We are currently reading The Odyssey for English 9 Standard. I am using two translations (Fagles, Lombardo) divided among the students. Using the two versions together gives all our activities an additional advantage. During the course of our readings, students will use both translations. The reading work has been hard –from learning new words and concepts, to discussing multi-narrative structures. Forging access into the ancient story as contemporary readers has been a journey. We are looking and listening to Homer as a storyteller, as an original image-maker. His unfading visual melodies continue their long lasting effect. In Bk 5 we explored closely how events, characters, and even spaces were framed by similes/comparisons. We discussed how words create images in our heads, why certain images are better than others. And we even created our own similes/comparisons for a present day situation. As a class we are investigating how words move about, create, and frame as suggested in Reading Literature Standard 9-10 R.L.4: Determine the meaning of words and phrases as they are used in the text, including figurative and connotative meanings; analyze the cumulative impact of specific word choices on meaning and tone (e.g., how the language evokes a sense of time and place; how it sets a formal or informal tone). Stories pull us in through acts of the imagination. When we read ‘the green lawn’ images sprout in the our mind. What kind of green? What kind of lawn? What time of the year? How large? During our class discussion students shared various types of lawns they had pictured. Many differences came to light. We had some overlaps, but each student could see how they visualize green slightly different than their peers. Using the line above, I asked the students to draw a visual picture of this simile. Re-directing and participating in the visual process creates another method of determining meaning(s). The image could be abstract or concrete. They could use color or pencil. They could use several pages or one. I wondered how they would proceed. How much of the story will they visualize? How will they visualize ‘mist’, ‘morning’, ‘packed’? Will they show the conflict? The reason for the surprise? In a further post, I will provide their responses and from here show how the practice of visual literacy skills opens worlds from letters. If we step back from the specifics of the exercise a number of critical and creative frameworks are present. A Language Arts classroom is an ongoing exploration of how readers make pictures with words. Image making from words is an abstract process involving mind and body. When image-making we always miss some aspect of the visual field and often find aspects others may have overlooked. Drawing and constructing an image directly from a text creates conversations on how meaning(s) is determined and how figures of speech dance between the literal and the conceptual in order to create an invitation of ‘seeing’. Ongoing vibrant, thoughtful placement of close readings and close drawings in the classroom routine creates an abundance of world viewing, world making. For the role of the imagination in reading see, Wolfgang Iser’s ‘Indetermincy and The Reader’s Response’ in K.M. Newton’s Twentieth Century Literary Theory (St. Martin’s Press: New York, 1997) 2nd edition. The collection has an excellent and wide-ranging selection of numerous literary theorists and Newton provides insightful overviews for each school of thought. For a fuller version of Iser’s position see his The Fictive and the Imaginary: Charting Literary Anthropology (John Hopkins: New York, 1993). Concerning the role of language, genre, and abstraction see James Moffett’s Kinds and Orders of Discourse, in Teaching the Universe of Discourse (1983). Homer. The Odyssey. Trans. Stanley Lombardo. Hackett Publishining: Indianaopolis/Cambridge, 2000. Homer. The Odyssey. Trans. Robert Fagles. Viking: New York, 1996. William T. Harris, Andrew J. Rickoff, and Mark Bailey. 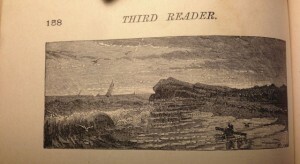 Appletons’ School Readers: The Third Reader. American Book Company: New York, 1887. This is such a great way to do the one thing we strive to do for kids in high school: engage, engage, engage! This level of interaction wakes up their senses and allows for their own visual voices to be seen.